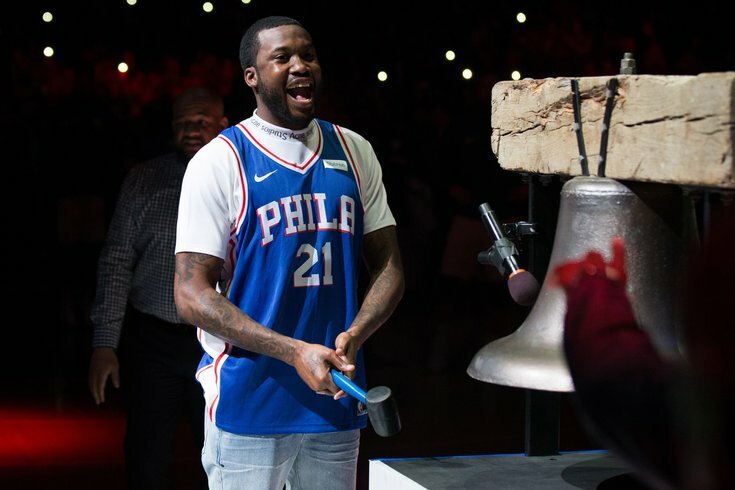 Meek Mill doesn’t waste any time amping up expectations on “Championships,” his fourth studio album out Friday: The introduction samples Phil Collins’ "In The Air Tonight," the ultimate tension-builder, while Mill raps about wearing the crown. From that insurmountably high opening note, the North Philly native’s first full-length after serving five months in prison and turning into a surprising mainstream icon for the prison-reform movement, manages to keep soaring. He routinely tackles systematic injustice, both in his case and across the country, throughout the record. RELATED: Meek Mill shares two new songs on "The Tonight Show with Jimmy Fallon"
He feels like someone who isn’t just talking the “this trying experience showed me something new” talk: This is a whole new approach. Mill seems zeroed in, and he has a very clear purpose. Of course, across 19 songs there are bound to be some lower-stakes tracks. The Cardi B-assisted “On Me” brings tales of Rolls Royces and women, like a younger Mill who never missed a beat. “Splash Warning” is another feature cut, this time squeezing Future, newcomer Roddy Ricch, Young Thug, and Mill into less than 180 seconds. It’s eccentric and it’s new, but it’s not terribly substantive. The ballyhooed collaboration with enemy-turned-pal Drake, "Going Bad", features a playfully off-kilter beat while Mill says there's no neighborhood in Philadelphia he can't go, which is true. These songs are fine and sometimes fun, if also obvious filler. It shouldn’t come as a surprise that a man with so much time on his hands has an abundance of ideas, and sometimes stray songs like “Splash Warning” seem almost out of place, perhaps better used as loose singles released at a later date. The emotional highs in the songs which Mill clearly poured himself into, though, are astoundingly high. Mill's walking the walk, and then talking the talk. You can't fault him if you can't find the fault in his approach. Mill said in a Vulture interview this week that he’s made it a point to be more outspoken because he feels a new kind responsibility. It’s clear he’s taken this approach and pushed it directly into his music. His ideas are clear, the production is varied and beautiful. The 31-year-old sounds reinvigorated, and both his music and his fans are better for it.